Bord Na Móna Growise Rose, Tree & Shrub Compost is not suitable for acid loving/lime hating (ericaceous) plants like rhododendrons, azaleas and camellias. Bord Na Móna Growise Ericaceous Compost is best suited to this group of plants. Bord Na Móna Growise Rose, Tree & Shrub Compost contains all the nutrients your plants need for the first 5-6 weeks in their new setting. From then on, feed them every 7–14 days with a suitable fertiliser. This product should be stored in clean, dry and cool conditions, out of bright sunlight. Make sure it cannot be contaminated by garden chemicals such as weed killers, fertilisers etc. Keep bag closed when not in use. 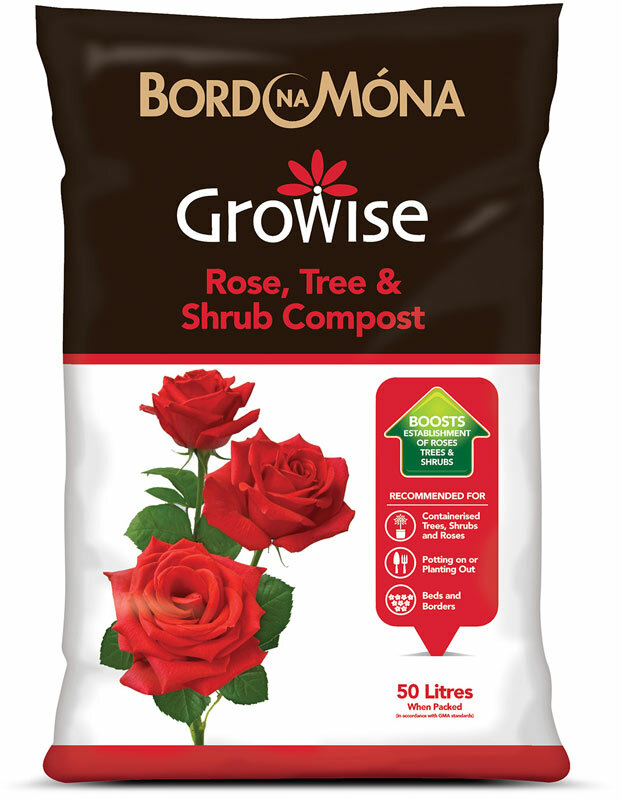 Bord Na Móna Growise Rose, Tree & Shrub Compost is specially formulated for many types of shrubs, trees and roses. It has multiple applications and can be used in beds and borders, potting on and striking cuttings. Dig a hole that is wider than the root ball of the plant to be planted. Add a thick layer of Rose, Tree & Shrub Compost all around the planting hole. Set the plant into the hole, making sure the plant is at the same depth as it was in the original pot. Add a mixture of Rose, Tree & Shrub Compost and soil (50:50) all around the root ball, and firm in gently. Water the plant well in its new position to help quick establishment. Take a healthy plant and make a clean, angled cut below a leaf. Remove the lower leaves from the cutting. If using rooting powder, dip the end of the cutting into a rooting powder following manufacturer’s instructions. Loosely fill a pot with Rose, Tree & Shrub Compost, make a hole in the compost and insert the cutting. Gently firm the compost around the cutting. Water the cutting using a watering can with a fine rose. Cover the cutting and pot with a clear plastic bag with punched holes to retain moisture. Once watered, the tray or pot can be left in a sunny spot but away from direct sunlight. 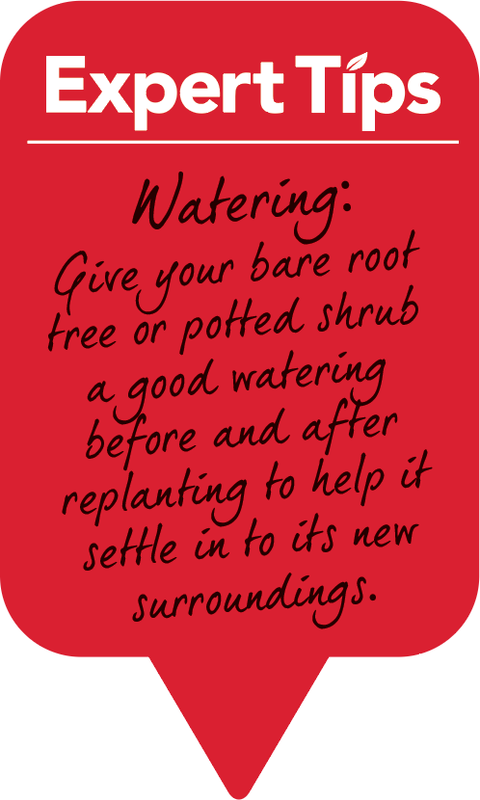 Water the pot again when the compost feels dry, or if the cutting starts to wilt. For specialist seed and cuttings use John Innes Seed Compost. Take a clean pot and partly fill it with Rose, Tree & Shrub Compost. Remove the plant from the old pot by holding an open palm at the base of the stem, turning the pot upside down and tapping the sides and bottom of the pot. Place the plant into the new pot making sure the plant is at the same level as it was in the original pot. Fill around the sides of the plant with compost and firm lightly. Water well, but do not over water as this may leach nutrients or cause water logging.